The economic calendar today is void of any major market moving events. Both the Asian the European trading sessions are practically quiet with the UK markets closed on account of a Bank holiday. In the eurozone, private loans and M3 money supply data are scheduled but they are not expected to shape the markets today. As a result, traders will be focusing on the events from last Friday at the Jackson Hole symposium. The euro posted fresh multi-year highs on Friday. The gains came despite both Yellen and Draghi not speaking much about monetary policy. The speculative rally in the EURUSD thus brings some risk of a correction. ECB's Draghi only merely acknowledged that the Eurozone economic recovery was strengthening, but refrained from saying anything beyond that. Despite the lack of clear clues, traders piled into the EURUSD long side as the currency pair rallied after forming the inverse head and shoulders continuation pattern on the short term charts. This could mean that a near term correction in the EURUSD could be possible and could put at risk any weak long positions at the current levels near 1.1900. 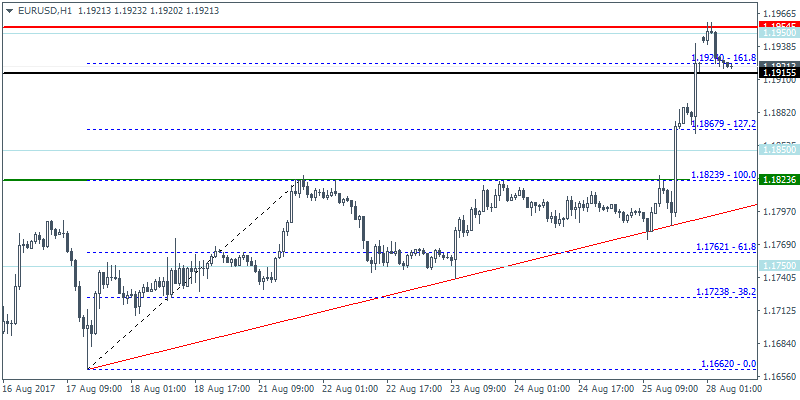 The 1-hour chart shows that EURUSD has completed the measured move towards 1.1924 of the ascending triangle pattern. Support (which previously served as resistance) at 1.1823 is therefore the ideal level that could be tested on a pull back. Therefore, we go short at 1.1915 with stops at 1.1954, while targeting the support level at 1.1823. We expect to see the near term declines coincide with the U.S. economic data later in the week such as the GDP report and the ADP private payrolls.